A multi-modal public transport network for the BMA has been proposed to be developed to meet expected commuter’s travel needs. Integration of various modes of transport is vital to evolution of a least-cost and viable transport system. Objective of an integrated transport system is to offer maximum advantage from economic, traffic and planning considerations. Various transport modes are to be integrated in such a way that each mode supplements the other. For effective integration, total transport system has to be planned, implemented and operated under common policies. 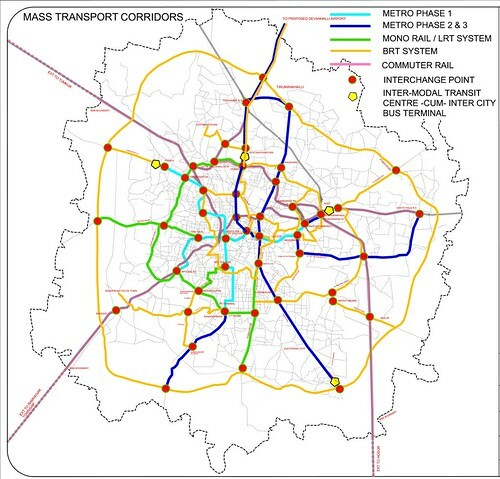 Depending upon the forecast transport demand and other parameters along various corridors, an appropriate transport system giving least-cost option has been proposed. 8.2.1 It is not possible to provide direct origin to destination service and vice a versa for all commuters. The need to interchange modes and or corridors is an essential feature of any public transport system. The planning objective as stated earlier is to minimize the need to change and when change is essential to make it as convenient as possible and with minimum time loss. 8.2.2 The proposed network includes corridors that are collector routes to serve areas at some distance from the mass transport routes. Another corridors are radial that normally would be direct origin to destination routes and hence will meet the objective of minimum interchanges. There are circular routes that will interchange with the radial routes. 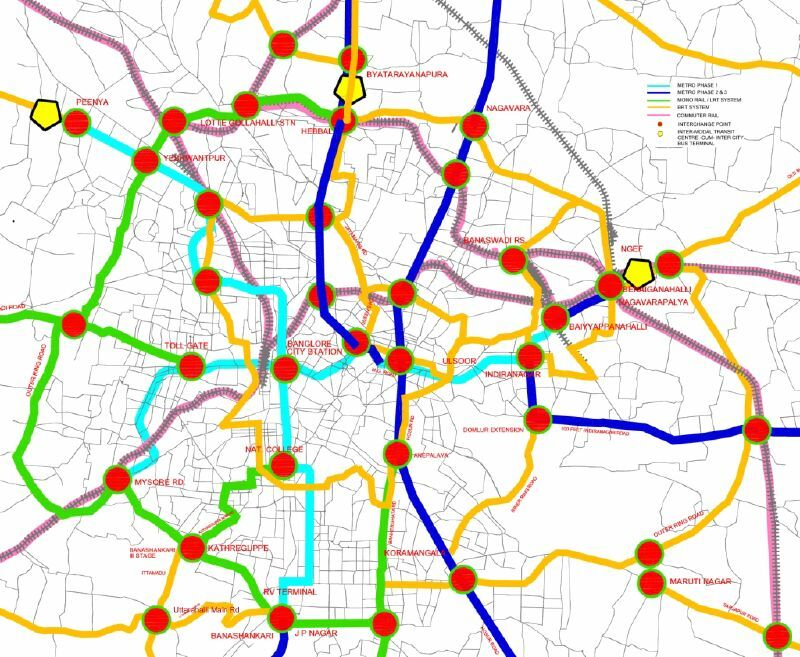 On these routes, one interchange should meet the needs of most commuters. The overall network of radials and circular corridors has formed a grid and hence most commuters should not need more than one or two interchanges. Feeder services to the proposed network will also be important in order to provide convenient and quick transfer of passengers from one mode of transport to other. As all commuters will not be living within walking distance of the proposed network, proper planning for feeder services will be necessary to ensure the forecast passenger demand on the system. For catchment area of about 0.5-1 km from the proposed network, commuter can easily access it by walk. People residing in next 1-km can reach station by cycles, scooters, autorickshaws and mini-buses. Areas outside the 2-km catchment area will require regular feeder bus services to important terminals/stations. Feeder services can also be provided by Para-transit modes. However, choice of a particular mode will depend upon passenger demand, road cross-section, road gradient, etc. 8.4.1 One of the most important elements of transport integration is the provision of inter-change facilities. Required inter-changes will be between the proposed mass transit systems such Metro, CRS, LRT/Monorail, BRTS and with other feeder services. Integration facilities at stations would depend upon expected station load to ensure proper system utilization. This will also include approach roads to stations, circulation facilities, pedestrian ways and adequate parking areas for various modes that are likely to come to important stations including feeder, bus/mini-bus routes. The provision will have to be made for peak demand at each station. At either stations, proper road based integration is to be ensured. 8.4.2 Figure 7.1 shows the interchange points in the mass transport network. There are 49 locations of interchange with high capacity mass transport modes. 8.4.3 The main issue is to make these interchanges convenient with minimum time penalty. Facilitates for interchange between modes/corridors should be planned for convenience and minimum loss of time. Side by side or vertical interchange that involves minimum walking is the best and hence has to be the norm in planning. It is proposed that planning and design of convenient interchanges and safe access from the area up to stations and stops forms the subject of a special study devoted to achieve the objective. Integration at operational level will be required to synchronize the timings of mass transit and feeder services. For efficient inter-change, walking/waiting time at these stations will need to be minimized. Introduction of common ticketing and their availability at convenient places will be necessary to ensure forecast patronage of the system. An integrated passenger information system covering all modes through publication of common route guides, time-table, information boards at terminals for providing up-to-date information for the system users will also be important.